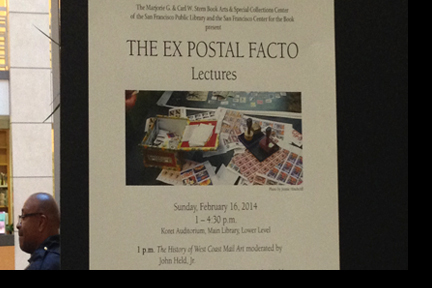 This entry was posted in ex postal facto, ex postal facto musings and tagged ex postal facto, mail art, red letter day. Bookmark the permalink. An EXP yearbook? Be still me heart! Another wonderful idea from the fabulous Red Letter Day. The whole XPF weekend was wonderful and amazing and no one but you could have pulled it off. Thank you so very much. An EXP yearbook? Be still my heart! Another wonderful idea from the fabulous Red Letter Day. The whole XPF weekend was wonderful and amazing and no one but you could have pulled it off. Thank you so very much. ditto to pamela’s wise words!!! It was an amazing weekend! Thank you very, very much. I haven’t sorted and organized my bits and tales, but I do have one anecdote to share in the hopes it will jog someone’s memory so I can put a name to a face. 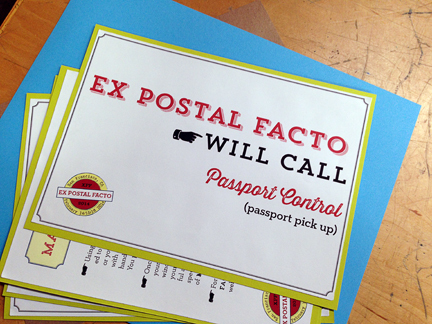 On Friday night, I was standing near the Will Call with a stack of postcards in my hand. The cards were all addressed and had their postage and only needed my message. Silly me thought I’d write postcards that night. I always think I’m going to write at event like this and always forget that I am too busy socializing to do so. Anyway, the top card had the name and address of a woman in New Mexico who adopted a postcard from my project a while back. I was planning to send Austa a thank you from the event. One of the XPF volunteers (I’m pretty sure she is a volunteer) said “I know Austa!” We chatted a bit, and I wanted to let Austa know who it is in SF I met, but I forgot her name! Hi Jennie–Great event planning and execution from you, John H. and your team. I really enjoyed Sunday’s oral history session. It was heartwarming to be part of a real vs. virtual community. Question: what is best way to get my copy of the ‘mail/art/book’ catalog. Can I pick it up at SFCB – maybe post answer in the blog for others with a similar question. Thanks for your thanks! Glad to hear that you had a wonderful time over the course of the XPF weekend. 🙂 I agree: it was wonderful to hear stories of mail art history directly from the folks who spent/spend so much time and energy making it happen — a truly singular opportunity. Once the SFPL edits the videos and puts them online, I’ll be sure to let everyone know (via the XPF blog). 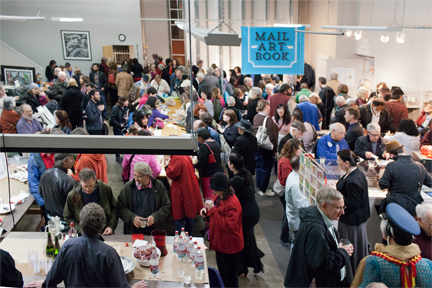 In answer to your question: copies of the “mail/art/book” exhibition catalog can be ordered directly from SFCB. Today’s blog post titled “Interested in purchasing a mail/art/book Catalog?” has all the details. I am settling down to put together the “thank you” documentation which will be sent to all of the artists in the show (300! ); expect to see that sometime in late April. Cascadia Artpost will forward a few stories over the next few days, but here’s a big hug and thank-you to Jennie and the XPF team for creating a memorable mail art weekend! How can we purchase the book??? Take a look at today’s post titled “Interested in Purchasing a mail/art/book Catalog?”; all details for purchasing an exhibition catalog are ready for your perusal! Congratulations on organizing such an amazing and inspiring event, Jennie. And I enjoyed participating in your Signed, Sealed and Delivered class. (This is Gregg in my cyber identity.) I will be sending you a piece of my inaugural mail art soon from my assemblage/mail art series “From the Museum of Unclaimed Ephemera”.